We had a long day yesterday and even though we were in bed before 11 PM we still slept in until 8 AM this morning. I did not make coffee and we did not have breakfast as we were picking up Mara at 8:50. We shut down our computers and iPads and packed them for travel. We set the windows in the bus so the cats would be comfortable. At 8:45 AM we loaded the car and drove over to get Mara. We stopped at the Dunkin Donuts in Arcadia for coffee and bagels and then headed west on FL-70 for Ed and Betty Burns’ place in Bradenton. Everglades National Park entrance sign on the road from Homestead and Florida City, FL. The main purpose of our visit today was to upgrade Linda’s Samsung laptop computer and my ASUS notebook computer to Windows 10 using Ed and Betty’s unlimited broadband data. A secondary objective was for Linda to purchase/download the latest version of Turbo Tax. Our tertiary goal was to update iPad and smartphone apps. We got to Ed and Betty’s a little after 10 AM, introduced them to Mara, and got busy setting up our computers. We had a bit of a false start but finally had the Windows 10 installation process launched by 11 AM. After quite a bit of conversation, Linda and Betty busied themselves making lunch and Mara settled in to go through her mail. Once the files for Windows 10 appeared to be downloaded I initiated the update process for eight apps on my iPad2. Betty washed off a bag of red grapes and set them out for all of us to enjoy. The ladies left around 1:45 PM to go for a walk while Ed and I stayed behind. I connected my phone to their Wi-Fi and updated a dozen apps. My computer was finally ready to configure Windows 10 at 2 PM and I went through the customized personalization rather than accepting the Express Setup defaults. My iPad was up-to-date so I started working on this post while I waited for the Windows 10 process to finally finish. It took until 2:30 PM for my computer to be fully booted up and usable. About that same time Linda’s computer was finally ready to configure. I wanted Linda here for the configuration choices so I waited for her return. The ladies got back at 2:45 PM and Linda resumed configuring her machine. We had originally planned to go see the 3 PM practice session of the Royal Lipizzan Stallions in Myakka City, but we would have had to leave at 2 PM to get there. We will definitely go seem them, but for now this was, once again, deferred to a future day. Linda purchased, downloaded, and installed the latest version of TurboTax and was done installing updates by 4:20 PM. Her update process went smoothly, if slowly, and without any apparent hitches. When the initial Windows 10 upgrade finished on my machine I did not have any of the quick start or system tray icons which concerned me greatly. After rebooting my computer, more than once, the icons eventually returned. I installed an undated driver for the NVIDIA GeForce graphics processing unit (GPU). I also had a problem with the sound but was able to resolve it using the audio troubleshooter. I rebooted my machine for what I hoped was the last time at 4:45 PM. It took 15 minutes to fully boot up and I made one more check for updates. It appeared that the operating system updates were all done but there were still updates to install for Adobe Photoshop and Lightroom, both of which are large and tend to take a long time to download. By this point Betty had opened a couple of bottles of wine and convinced all of us that the collect best option for dinner was to order pizza and eat at their house. Linda coordinated the pizzas and ordered them from Vertoris’ where we ate last night and which was only seven miles away. While she and Ed were in transit to get the pizza and salad I updated Photoshop and Lightroom. I started each program and Photoshop indicated that it had a problem with the video card driver and had disabled some of its enhancement features. That was not an immediate problem as I do not presently make any use of Photoshop, but the incompatibility was distressing nonetheless. I had done what I could in the way of updates for today so I shut down my computer and packed it away to clear the table for dinner. Betty set the table and Linda and Ed returned a short time later with the food. We sat down to a wonderful meal with friends that finally concluded around 7:30 PM. It had been a wonderful day with friends and we had gotten a lot accomplished thanks to the use of their technology, but by 7:45 PM we were all tired and the three of us were on our way back to Arcadia. We dropped Mara back at her motorhome at 8:45 PM and were back at our coach by 8:50 PM. We watched the end of an episode of Endeavor and then watched another complete episode. By then we were sleepy tired and went to bed. We slept in this morning until after 8 AM and so did the cats. We lounged around in our sweats drinking coffee and eventually had granola for breakfast. It was cloudy with rain coming and we considered spending the day in the bus in our sweats when we remembered that it was the first Saturday of the month. The Everglades is vast and low, but is not a swamp. Swamps involve stagnant water. The Everglades is almost entirely shallow, but constantly flowing, water like a river. Everglades NP, FL. The Arcadia Farmers Market takes place on the first and third Saturday of each month so Linda texted Mara to see if she wanted to go. She did, so we got dressed, picked her up in the car, and drove downtown. To our disappointment there were only four vendors there and only two of them were selling food. One was a local farm that had freshly picked Napa cabbage and locally produced honey. Linda bought a head of the cabbage and Mara bought a cabbage and a jar of honey. We took a short walk around downtown and then drove to Joshua Citrus Co.
At Joshua Citrus we bought a few Ruby Red grapefruit and a few Honeybelle tangelos. Mara also bought a variety of citrus including Meyer lemons. We stopped at Walmart on the way back to our RV resort for cat litter and a few sundry items while Mara picked up some groceries. We dropped her at her motorhome and took a minute to meet another couple from Howell, Michigan who were just getting ready to pull out. We then returned to our rig around 1 PM. Linda made rollup sandwiches with soft tortillas, Napa cabbage, dark greens, and hummus. At 1:30 PM she phoned Mara to see if she wanted to go for a walk and headed over to rendezvous with her. I had a call earlier from Dave Aungier and called him back. He had downloaded his BCM article from my Dropbox and reviewed it. We went over a few minor changes, which I made to the Word doc, and discussed the process of submitting it to the magazine and working it through to publication. Dave and I were done talking by 2 PM and it had started to rain lightly. Linda had worn her raincoat but returned around 2:30. By that time I had turned my attention to the three articles that Stacy had finished proofreading and returned to me. I went through each one and accepted most of the changes. I then went through each one and made sure I had all of the image files properly identified and organized. I backed up all of the files, moved them to the READY folder, and then uploaded them to my Dropbox. Once everything had transferred I e-mailed Gary (BCM publisher) and Jorge (layout) and let them know the files were there. I had a few more e-mails back and forth with Gary and had to redo a panoramic photo that had discontinuities in it that I had not noticed. Mara came to our rig to discuss some logistics related to the Holistic Holiday at Sea cruise that she and her friend, Michael, are going on at the end of the month. As it turns out we will take them to Miami and pick them up when they return and take care of Mara’s two cats while they are away. Mara waited for a lull in the rain and returned to her rig a little before 6 PM. For dinner Linda prepared a salad with diced Napa cabbage and honey roasted peanuts and a homemade dressing made with rice wine vinegar, sesame and vegetable oils, Dijon mustard, fresh grated ginger, salt, and pepper. It was very good. She then reheated the leftover pizza from the last two nights. The pizza was exceptional when it was fresh and, although it lost its crisp crust on reheating, it was still tasty as leftovers. While Mara was visiting the leak around the bedroom ceiling vent/fan reappeared. The lower outside corner of the lower passenger side windshield also leaked, but we expect that to happen every time until we do something to fix it. After dinner we watched a couple episodes of Endeavor and then a couple of episodes of As Time Goes By. After that we watched a PBS documentary on Jason Blair, the discredited New York Times reporter. We caught a few minutes of news and weather and went to bed. Today was just one of those days. It also happened to be Super Bowl Sunday, but that’s another story. As we do most days we started our morning with coffee.” As she often does on Sunday mornings, Linda made vegan pancakes for breakfast. We split a ruby red grapefruit as well. Though much of the Everglades is open, there are stands of trees throughout. 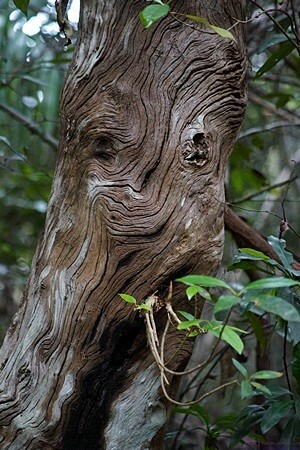 This one had a “face.” Everglades NP, FL. Linda walked to Winn-Dixie with Mara while I settled in to work at my computer. My plan was to edit and upload blog posts but in the end I only got two more posts ready to go and did not get them uploaded. Not that I was goofing off; I was busy all day but ended up taking care of other things. For starters, I downloaded an updated version of the Logitech SetPoint software for my Logitech UltraThin Touch Mouse and then reconfigured the settings. The mouse is capable of a variety of things with just subtle movements but seemed to be less stable than before the Windows 10 upgrade. I was also having problems with my cursor jumping around while typing. I initially noticed it while typing e-mails but noticed it later while working in Word. Linda had the presence of mind to suggest that it might be the touchpad. Sure enough, the touchpad was active. That had not occurred to me because it wasn’t active under Windows 8.1. Apparently the upgrade to Windows 10 activated it. So much for maintaining my existing settings. I had additional e-mails back and forth with Gary and Jorge at BCM, as result of which I updated the BCM page on our website. I also e-mailed Brenda Phelan to check on the status of our tire covers. When I finally got to work on blog posts I selected and processed several photos from our visit on Thursday to the Ringling Estate. I then edited the two posts mentioned previously. When Linda got back from Winn-Dixie she made rollup sandwiches for lunch with dark leafy greens and garlic hummus in soft tortillas. We had red grapes to go with the sandwiches. After lunch she walked up to the mail room. I got a happy birthday card from our daughter and son-in-law, which was nice. The eight pounds of coffee we ordered from Teeko’s back home had also arrived. I checked the order to make sure it was correct. It was, so I stored the box as we won’t need it for another couple of weeks. I exchanged a couple of text messages with my daughter and decided it would be easier to just call her. We had a nice chat. Mara walked down to our coach mid-late afternoon and the three of us went for a vigorous walk through the entire RV resort. We all returned to our bus and visited long enough for me to demonstrate the mapped location history feature in RVillage. Mara headed back to her rig around 5:30 PM and Linda started fixing our dinner. She made vegan Sloppy Joe’s with TVP and baked sweet potato fries. Yum. Eventually it was time for Super Bowl L (50). I had intended to continue working at my computer all evening but my enthusiasm had waned and I found the game distracting. We kept the volume down and played games until 9 PM and then switched the TV to PBS and watched Downton Abbey. When it was over we switched back to the game. It looked like the Denver Broncos were going to beat the Carolina Panthers so we watched a documentary on PBS/World about a family in Japan. Linda went to bed when it was over but I switched to PBS/Create and watched a tribute concert to American film composer John Williams. Jasper curled up with me for a while and then indicated it was time to go to bed. 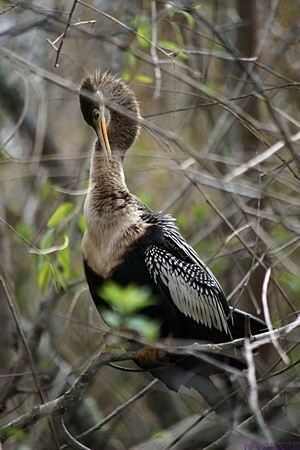 An Anhinga pruning its feathers. Everglades NP, FL. Linda checked our Verizon account via her iPad and we had used 7.03 of our 10 GB of monthly data plus the 2 GB of extra allocation we got for downloading and installing the Verizon go90 app on our phones. The data usage function on the Mi-Fi device (Novatel 5510L) showed 9.03 out of 12 GB as it combines all available data, so they were in agreement. It’s a good thing we have the extra 2 GB each month for the next few billing cycles. This current cycle (January 20 through February 19) has included iOS and app updates for both of our iPads, app updates for our Android phones, uploading of four BCM articles to our Dropbox (with lots of photos), numerous e-mails with large attachments, and upgrades from Windows 8.1 to Windows 10 on both of our computers. Even though we made some use of the resort Wi-Fi while at the laundry room, and did the Windows OS and some iPad/smartphone upgrades at Ed and Betty Burns’ place using their unlimited broadband connection, it has been a heavy period of data usage for our Verizon account. Twelve gigabytes is not enough data to get us through a typical month while we are away from home. We had granola for breakfast with fresh fruit and juice and then settled in to finish our coffee and doodle on our iPads. I e-mailed my blog posts for the last five days to myself and then download/installed the Gmail app on my iPad2. We took showers, got dressed, straightened up the bathroom, and got on with our chores. I turned on the electric block heater for the engine to warm it up for a maintenance start later today. We are headed to Homestead and the Florida Keys tomorrow for four days so today was, in part, a travel preparation day. Linda’s first task was a trip to the post office to mail the book she bought at The Ringling estate for Madeline’s Valentine’s Day present. We are taking the car and leaving the cats behind in Mara’s care so Linda wanted to clean up the bus a bit. We also both needed haircuts. Linda made a 1 PM appointment at a place near the Winn-Dixie. One of my tasks was doing laundry which I took care of at 11 AM. Linda finally got hold of a real, live person at the Florida Toll Road Sunpass system but the account is in my name and they would not talk to her. She found me in the laundry room and worked her way through the phone menu until she got back to an actual person and then put me on the phone. The woman was very nice and very efficient and it only took about 10 minutes to get our account reconfigured so we could access it. We logged in and confirmed that we still have a credit balance and updated our credit card information. When I was done with the laundry I turned on the Aqua-Hot engine preheat loop. When Linda got back from her appointment she cut my hair. Another task was giving Mara a key to our coach and going over the care and feeding of our feline friends. Linda took care of that. A few days ago our Progressive Industries EMS threw another PE2 error code, which indicates an open ground. The current error code is 0 (zero), indicating that everything is OK, so it is/was obviously a momentary problem. Presumably the problem is in the resort wiring as that is what the PI EMS is designed to monitor and protect against. I wanted to do done things with the bus chassis today so I took care of this at the same time. Unlike last time, I shut off the circuit breaker at the power pole, unplugged the shorepower cable, cycled the breaker a couple of times to wipe the contacts, cleaned the contacts on the plug, inserted and removed it several times to clean the contacts in the outlet, plugged it back in, and turned the breaker back on. All of that was designed to clean electrical contacts and remove a possible marginal connection. Another thing I did today was start the bus engine, let it warm up, moved the bus aft and for slightly to make sure the brakes were not frozen, and re-leveled the coach before shutting the engine down. I shut of the block heater and Aqua-Hot burner before starting the engine. We are a little over half way through our stay here at Big Tree RV Resort and given the often humid, rainy conditions I wanted to make sure the brakes were not rusted closed. I also wanted to check the fuel gauge as we have been running the Aqua-Hot diesel-fired hydronic heating system on cold mornings and it uses about 1/4 gallon of diesel fuel per hour when operating. When I was done with this process I turned on the fuel polishing pump so it could run while we were away. We still had enough gallons of fresh water on board that I decided not to dump and fill the tanks today. With the engine/chassis stuff taken care of my main focus today, when not preparing for our trip, doing laundry, eating meals, going for walks, and dealing with e-mails, was working on my blog. It may be the thing I want to do, but it is often not the thing I need to do, or in some cases, the thing I have to do. I failed to record what we had for dinner but I’m sure it was tasty. We watched TV for a while and then went to bed. My night was interrupted around 1:30 AM by very strong wind gusts. All of the awnings were out except the large patio awning and were perfectly capable of being damaged by the gusts. I put on my sweats, slipped into my Crocs, and went outside to stow the awnings. The two bedroom window awnings and the driver side living room awning are held open by straps with a loop on the end that slips over a hook mounted on the side of the coach. The roller tubes are spring loaded and self-retract when the straps are released. While retracting they have to be controlled, using a long metal rod with a right angle bend on one end and a semi-circle handle on the other, but are otherwise easy to deploy and stow. Besides the possibility of the fabric tearing where it mounts to the body or the roller tube, we had the front end of the driver side front awning flipped up by a strong wind gust in Sheridan, Wyoming. I would not have believed that was possible unless I had seen it happen, but we were not about to risk having it happen again. 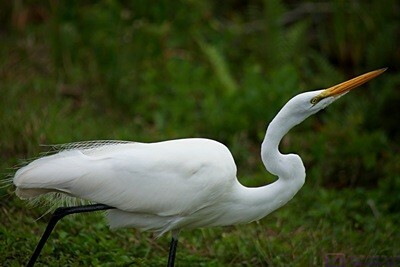 An Egret stalks its prey. Everglades NP, FL. I spite of my sleep being interrupted I was up at 7 AM. As we do every morning, we fed the cats, refreshed their water, and cleaned their litter tray. We finished packing, adjusted the windows, loaded the car, pulled out as of our site a little before 8 AM, and stopped at the dumpster to drop off a bag of kitchen trash. We drove to the local Shell station to fill the fuel tank and stopped next door at Dunkin Donuts for coffee and something to eat. We then headed east on FL-70. Our destination was Homestead, Florida and Everglades National Park. Our route was FL-70 east to US-27 south to FL-821 south (which is part of the Florida Toll Road system) to its terminus at US-1 in Florida City just south of Homestead. From there we headed west through Florida City and on to Everglades National Park. This part of Florida is very flat but it was still an interesting drive. It was cloudy and cool for the whole drive down. 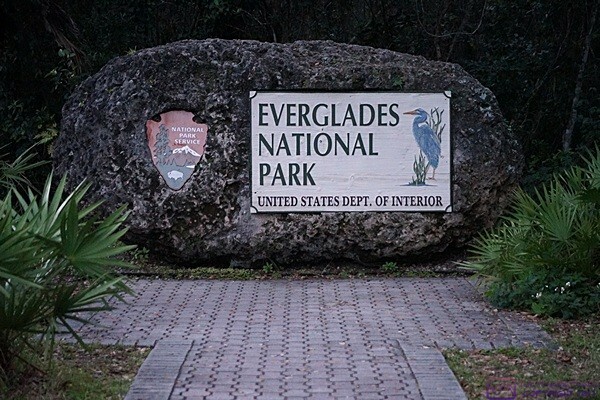 We stopped at the Visitor Center to get a map and stamp our National Parks “Passport.” We entered the park using Linda’s Senior Access Pass and a few miles in stopped at the Anhinga and Limbo Gumbo trails area. We walked both trails, each about 1/2 mile in length, and I took quite a few photos. By the time we got back to our car it was 1:30 PM. We were hungry and wanted to get more information about boat tours so we drove the 34 miles to Flamingo. We had lunch at the Buttonwood Cafe and went over to the Marina to check on buying fuel. They wanted over $5 per gallon so I passed. We also checked on the pontoon boat tours. Two different tours were available, one into Florida Bay and the other into the Mangroves. Both tours left on the hour starting at 9 AM with the last one departing at 4 PM. The tours lasted just under two hours, and cost $35. They did not take reservations and tickets could only be purchased the same day. We decided to return to the park tomorrow and deferred any decision about the boats until then. By this time, it was late enough in the day that we decided to start back towards the entrance 34 miles away. We stopped at Pa-Hay-Okee and hiked the boardwalk before leaving the park for the day. On the way back to our hotel we stopped at a Shell station in Florida City and filled the fuel tank for a more reasonable price per gallon. We found the hotel, a Hampton Inn just off exit #2 of the Florida Toll Road between Florida City and Homestead, and checked in. We had lunch rather later and were undecided about what to do for dinner, or when. We drove across the street to the Publix supermarket, bought snacks for tomorrow, and bought red grapes, hummus, and sourdough pretzel nibblers to have for dinner in our room. We had Direct TV in our room but eventually found PBS and CBS and watched our usual Tuesday night programs. We also found The Weather Channel and Weather Nation and checked the current weather and forecast for the next few days with great interest. Some of the coldest weather of the year was dropping down through the upper Midwest and Great Lakes, affecting the Northeast, mid-South, mid-Atlantic, and Deep South past our location and all the way to Key West. We had brought a variety of clothing, so we were prepared. This entry was posted in BCM, Big Tree RV Resort, Computers, Cruises, Family-Friends-Home, Flora, Florida, HH@S, Landscape, Natl Parks, PBS, Photography, RV-Travel, Weather, WFPB, Wildlife and tagged "sloppy joes" (TVP), Adobe CC app updates, Ahhinga Trail (Everglades NP FL), Android app updates, Anhinga, baked sweet potato fries, BCM articles, Bill & Brenda Phelan, Bradenton (FL), broadband, Buttonwood Cafe (Everglades NP FL), chili mac (vegan), cold front, Dave Aungier 1977 MC-5C, Downton Abbey (PBS), Dunkin Donuts (Arcadia FL), Ed & Betty Burns, Egret, EMS-50 (PI), Everglades NP (FL), Farmers Market (Arcadia FL), Flamingo service area (Everglades NP FL), Gary Hatt (BCM), Gold Tree MH Community (Bradenton FL), Hampton Inn (Homestead - Florida City FL), Holistic Holiday At Sea cruise, Housekeeping chores (H3-40), iPad updates, Jasper (the cat), Jorge Escobar (BCM), Joshua Citrus Co (Arcadia FL), Juniper (the cat), Limbo Gumbo Trail (Everglades NP FL), Logitech T630 bluetooth mouse, Mara Culp, MEF3, Meghan & Chris (Dexter), Napa cabbage, Novatel 5510L MiFi (Verizon), NVIDIA GeForce 860M driver update, pontoon boat tours (Everglades NP FL), Royal Lipizzan Stallions (Myakka City FL), SetPoint SW (Logitech), strong winds, Sunpass (FL Tollroads), TurboTax version upgrade, Verizon data plans, Vertoris' Pizzeria (Sarasota FL), water leaks (H3-40), Windows 10 upgrade, Zip Dee Awnings (H3-40) on 2016/02/09 by BRF. Storms moved through the area overnight with more lightning and thunder than rain, or at so it seemed. The storms were triggered by a cold front, behind which we had a cloudy day with periods of rain. Linda was up at 7 AM and read quietly until I got up at 8. I made a full pot of coffee (Cafe Europe half-caff blend from Teeko’s) and then joined her in the living room. Linda was checking Dr. Michael Gregor’s speaking schedule and saw that he will be at Wayne State University in December and will be one of the keynote speakers for the 2016 Holistic Holiday at Sea vegan cruise. We have not heard him speak in person, and will not be here in December, so that would be another reason to go on the cruise again. By 9:45 AM Mara had not emerged from her rig so we went ahead and had breakfast. Linda then went for a walk and I went to my office and worked on the design of the custom desk for the bus. Mara finally emerged at 10:30 AM and we chatted for a while until Linda got back. Our chat was briefly interrupted by a call from Mike (W8XH) on the Novi repeater so Mara got to see ham radio in operation. My reception was weak and noisy and according to Mike my transmitted signal wasn’t any better. The only thing that has changed since we tested this late last week is that I got the repaired M-302N VHF/UHF lightning arrestor back from Morgan Manufacturing yesterday and re-installed it. Mike is going to help me do some more testing, but I am rapidly coming to the conclusion that these units are defective by design and I will have to replace them with something else. I am disappointed to say the least. It was another cool, cloudy, rainy day, just the kind of day for staying inside and getting stuff done. Linda and Mara both had things to do and settled in at the dining room table to work. Mara has been focused on planning her upcoming travels and spent much of the day making reservations. Linda worked on the bookkeeping for our GLCC chapter and SLAARC ham radio club (she is treasurer of both). She also renewed our Coach-Net emergency road service and our Harvest Host membership, which had expired, and probably took care of a lot of other things that I don’t even know about. Except for an occasional break I worked on the custom desk design until 6:30 PM. On one of those breaks I needed to measure something in the bus so we gave Mara the inside tour. When I came upstairs Mara was taking advantage of the unlimited hot water available in our guest bathroom to have a nice long shower. We know from personal experience what a luxury it is to take such a shower when living in an RV. Linda had started preparing our dinner so I opened the bottle of Hatch Red Chili wine. This wine, from St. Claire Winery in Deming, New Mexico is one of the more unusual wines we have ever had but we really like it. It is a slightly sweet red wine with no tannin, a hint of chili flavor, and heat in the back of the throat on the finish. We had vegan mock Italian sausages with sautéed onions and red peppers and the wine went well with it. I had mine on a hotdog bun with mustard. Mara had another serving of her beef stew, which she is trying to use up, and Linda put out a plate of whole, fresh strawberries. One of the nice things about having visitors is that meals take longer to eat as we linger at the table in conversation. Mara returned to her rig around 9 PM to have some quiet time with her cats before going to bed. Linda decided to watch a couple of TV programs and I went back to work on the desk design. I called it quits around 10:45 PM and went to bed to work on this post. The overnight low is forecast to drop into the upper 40’s which should make for excellent sleeping. This entry was posted in Cruises, Family-Friends-Home, HH@S, HHat, Weather, WFPB and tagged Cafe Europe half-caff Blend, fresh strawberries, GLCC, Hatch Red Chili wine (St. Claire Winery), Holistic Holiday At Sea cruise, Mara Culp, Michael Greger MD, Mike (W8XH), Morgan M-302N V/U Lightning Arrestor, Nutrition Facts website, SLAARC, St. Clair Winery (Deming NM), Teeko's Coffees & Teas (Howell MI), thunderstorms, vegan Italian sausage with sauteed veggies on 2015/07/14 by BRF. Linda got up before I did and went for a long walk. I was up by the time she got back and made a full pot of the Sumatra Mandheling coffee I just got from Teeko’s. Mara eventually joined us for coffee and then breakfast. Mara wanted to get the engine and generator serviced in her Fleetwood Bounder motorhome and asked for recommendations in the area. There were three relatively convenient options but we had her contact Cummins Bridgeway in New Hudson, in part because she has an Onan (Cummins) generator and in part because we took our Itasca Sunrise motorhome there and were always pleased with the quality of the service. They said they could take her on Thursday and she set up the appointment. They estimated three to four hours so she plans to wait for it. After scanning what was available we focused in on the weBoost Drive 4G-M and Drive 4G-X. I downloaded the PDF manuals for each of them and studied the specifications. I don’t care about the marketing hype. As they used to say on Dragnet “the facts mam, just the facts.” Both units are 5-band, multi-mode units designed for in-motion use and the specs were very similar, but not identical. The MSRP on the X model was almost $100 more than the M model so I called Cellular Solutions and talked to Judy. In practical terms, she said the X model would work with weaker signals. I was prepared to order two of them but they did not have them in stock at their Sanford, Michigan location. She thought she could have them to us by Friday but that was not soon enough and we did not want to pay $30 for 2-day shipping on top paying almost $30 in sales tax (for each unit). So we did what we always do, we checked Amazon. Amazon had four of the weBoost Drive 4G-X systems so I ordered two of them with Prime 2nd day shipping of $4.99 each and no sales tax. They are scheduled to arrive on Wednesday July 15 which will give us enough time to get them installed. The installation on both rigs will require me to attach a steel plate to the roof to act as a base for the small 4″ tall magnetic mount outside antenna. On our rig I will probably put the antenna up front and screw the plate to the existing aluminum plate, using putty under all the edges and the screw holes, and then caulk around the edge and the heads of the screws. The cable will come in through the front weatherhead. On Mara’s rig I will see if I can route the cable through the refrigerator roof vent or the roof-mounted air-conditioner cover. The route will determine the placement of the steel base plate. Linda made an appointment for Mara with our hairdresser, Renee, at the J. C. Penney’s salon at 12 Oaks Mall for Wednesday at 1:30 PM. By the time we had accomplished all of this it was early afternoon and time for a light lunch. After lunch Linda and Mara went for a long, vigorous walk and I retreated to my office and worked on the custom desk design. I e-mailed Jarel to see if he would be available on Thursday. He e-mailed back that any day but Thursday would be OK, so I may go Friday but more likely it will be next Monday. I thought I could have the design done by Wednesday bedtime, but it would have been a push and I did not want to rush the process and risk making a mistake. As much as I hate to delay this until next week I may have to. Mara may leave on Friday, or delay until Saturday or Sunday, and I want to be hear when she leaves. Meanwhile, Madeline is coming to stay with us on Friday and will be here until Monday. These are indeed busy times. I came back upstairs just before 5 PM and found the ladies sitting in the shade at the east end of the deck. Mara was busy using MapMyPlaces to plan the next leg of her travels from our house to Quebec City, a trip of just under 1,000 miles. I got a couple of ice cold beers (Linda did not want any) and we sat and talked until Mara returned to her rig at 6:30 PM to tend to her cats and have an hour of quiet time before dinner. We got back together at 7:30 PM for dinner, which consisted of leftovers plus a simple salad for us. Dinner led into a long discussion about health and nutrition. We talked about the Holistic Holiday at Sea vegan cruise, which usually takes place the first week in March, and the vegan summer fest that takes place each July in Pennsylvania. Mara seemed interested in both and thought she might be able to get her friend, Michael, to go on the cruise with her. The more we talked the more we thought we might like to go again. The last time we went, in 2013, we researched places where we could board the cats. The only place we found that looked any good was in Punta Gorda. Punta Gorda is quite a drive from Ft. Lauderdale, but it is not that far from Arcadia where we will be parked for January and February. It would be easy to take the cats there and then drive to the Port of Miami to catch the ship. However, if Mara goes on the cruise we might have another option. When she has to leave her rig for a while, such as her recent trip to Belgium, she flies her sister in from California to house and cat sit. She assured us that “sis” would be happy to take care of our cars as well. All that would be required would be for us to have our motorhomes at the same RV park. That could be Big Tree in Arcadia (since we would already be there) or someplace near Miami (if we could both get in). Adjacent sites would be nice, but not necessary. I have no idea if we will do this, but it was fun to consider the possibility. This entry was posted in Big Tree RV Resort, coffee, Family-Friends-Home, Florida, Pets-Vets, WFPB and tagged Big Tree RV Resort (BTRVR), cat bording (Punta Gorda FL), cat sitting, cellular booster, Cummins Bridgeway (New Hudson MI), Fleetwood Bounder, Holistic Holiday At Sea cruise, Jarel Beatty Cabinetry (Logansport IN), Judy (Cellular Solutions), MapMyPlaces app, Mara Culp, Renee (JCP salon), Sumatra Mandehling (Teeko's), Teeko's Coffees & Teas (Howell MI), Vegan Summerfest (PA), weBoost cellular boosters, weBoost Drive 4G-M, weBoost Drive 4G-X on 2015/07/13 by BRF. At 5 AM I was vaguely aware of the sound of rain. The cats were chasing each other through the house so I got up to make sure nothing was amiss, such as another mouse. They were just having a bout of morning friskiness. I added a little food up to their bowls, which drew their attention, and went back to bed. 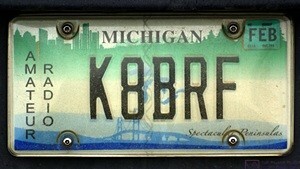 My Amateur Radio vanity license plate. There were a LOT of these in the parking lot at the SLAARC Field Day site. I finally woke up and got up about 8:15 AM and got dressed in a suitable manner for today’s American Radio Relay League (ARRL) Field Day event. The temperature was in the mid-50s, overcast and raining with blustery winds; not exactly the nice summer day we were all hoping for. Some of the members of the South Lyon Area Amateur Radio Club (SLAARC) were gathering for breakfast at the usual place (Senate Coney Island) at the usual time (8 AM) but we obviously did not join them today. I went to my office to retrieve my Sony DSLR and decided to turn on our Icom IC-7000 ham radio. I had it tuned to the SLAARC (K8VJ) repeater in South Lyon when Keith, KD8YYJ, announced his presence. He was driving from the west side of Howell to Wixom and seeing what repeaters he could hit. We chatted for 10 to 15 minutes and I invited him to stop by the SLAARC Field Day site at the South Lyon Township James F. Atchison Memorial Park. I worked all day yesterday as part of the SLAARC Field Day setup crew. There was more setup to do starting at 9 AM this morning but the setup mostly involved radios, computers, Wi-Fi networking, and power. I was not in any humor to rush off into the clammy weather conditions, and Linda was up by this point, so we had breakfast. She found some Silk brand ‘yogurt’ at Meijer’s last week so we had that. It was OK. It is a creamy style yogurt, which is not my preference, but it was tasty enough. Bananas, cinnamon raisin bread, and juice rounded out the meal. Linda even made the coffee. I turned on the natural gas fireplace to ward off the chill in the living room where we lingered and enjoyed our morning brew. The SLAARC Field Day operating stations use wirelessly networked computers (left) running N1MM Logger+ to record the contacts that are made. HF transceiver to the right. I finally left for the Field Day site around 11 AM. The operating event started at 2 PM but the first of four meals was lunch today at noon and I wanted to capture photos of the rest of the setup and the lunch event. It was raining lightly when I arrived and continued to rain until I left at 2:15 PM. In between arrival and departure I took some photos and helped out a little bit, but there were plenty of people there taking care of what needed to be done. Mike (W8XH) brought his Icom IC-2820H dual band mobile radio and several lengths of 50 ohm coax and we transferred those to my car. He then walked me through the various menus and functions his new Yaesu FTM-400DR/DE radio, a dual band (VHF/UHF) 50 Watt rig with digital voice capability and a color touch screen display. A group of SLAARC members recently purchased a Yaesu DR-1X repeater that works with the new Yaesu digital voice and data modes in addition to the traditional FM mode and are testing it as a replacement for the current, and very old, K8VJ repeater. Mike’s IC-2820H is available for $350 but the FTM-400DR has a $100 rebate through the end of June, bringing the price down to $500. As much as I would like to have a VHF/UHF radio in my car I am looking at one of these radios to install in the cockpit of the bus so we can use it going down the road. The long-term plan is to put the Icom IC-7000 HF/VHF/UHF radio in our towed vehicle and get the Hi-Q 80-6 antenna mounted and operational in addition to the Diamond SG-7900 VHF/UHF antenna that is already on the Honda Element. For base station use I would like to get an Elecraft K3s or Flex SDR rig. 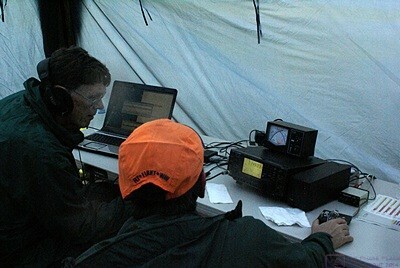 The K3s has become the rig of choice among the members of the SLAARC who are serious about working HF and contesting. Either of those are radios that could be fairly easily moved from the house to the bus when we travel. Antenna options in the bus could include running coax to the Hi-Q on the toad and/or a “flagpole” HF vertical that is mounted using the towbar receiver or a base stand that goes under one of the tires. An antenna switch would allow the use of the VHF/UHF antenna that was already installed for the cockpit radio. All of these “base station” options would obviously be for stationary use only. 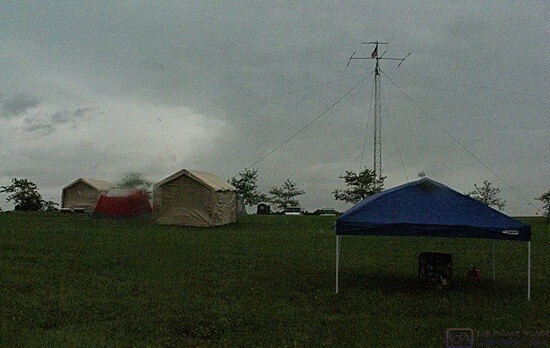 The ARRL FIeld Day event showcases the ability of amateur radio operators to set up equipment in the field on short notice and keep it on the air for 24 hours, no matter what. The weather turned bad for the event. The portable generator is under the tent in the right foreground. I uncoiled the coax cables that Mike lent me to see how long they were. There was a 5 foot piece that was too short for what I needed, and a piece that was approximately 40 feet, which was longer than I needed. The third piece was at least as long as the 40 footer. I “tagged” his coax with small white cable ties so I could identify them later and return them to him. I did not want to mess around switching coax cables in the rain so I unboxed Mike’s Icom 2820 and got it set up to use with my existing antenna and transmission lines. I spent a little time with the manual and then powered it up. It was already configured from when Mike used it in his ham shack so I did not need to do any setup to use it. I monitored both the South Lyon 2m and Novi 440 MHz repeaters and was able to “hear” both of them, although the South Lyon signal was much better (stronger, quieter, clearer) than the Novi. A couple of SLAARC members were on the South Lyon repeater taking care of Field Day business. I waited a suitable amount of time after they were done and called for Mike (W8XH) and he came back right away. We repeated the testing we had done last night. The performance with the 2m South Lyon repeater seemed to be much better but the performance on the 70cm Novi repeater was the same or worse with a fading component to the noise. I think we were on the air 15 to 20 minutes. Based on the test results from last night and this afternoon I think I have two separate issues that are probably interacting; the IC-7000 needs to be grounded and the 25 feet of coax from the cable entry box (CEB) to the radio (Go Box) needs to be shorter and much higher quality. I need to install the ground bar on the wall behind the ham radio desks and then purchase a suitable length of ground wire and run it from the CEB to the copper ground bar. I will also need to get a 15 foot length of 50 ohm LMR-400 coax from Scott (AC8IL) with an N-male connector on one end and a PL-259 connector on the other end. Linda prepared our dinner at 5 PM. She made corn-on-the-cob and “cowgirl steaks,” a new (to us) vegetable protein product she found at Meijer’s. After dinner we drove back to the SLAARC Field Day site to socialize with club members at dinnertime. The weather at our house was still rainy with light-to-moderate winds and occasional stronger gusts. We arrived at the Field Day site to find a flurry of activity and strong, steady winds out of the north with continued sporadic rain. 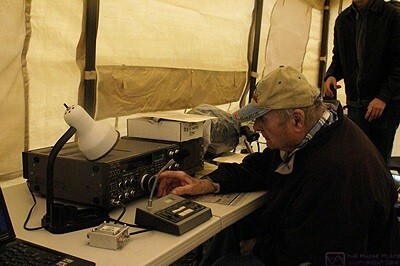 Jim (KC8WMW) stays dry as he works the GOTA (Get On The Air) station in one of the tents. The small red tent that was originally supposed to be the VHF tent was nowhere to be seen and at least eight people were engaged in trying to control and fold up the large canopy that the club purchased yesterday at Costco to serve as the combined VHF and GOTA tent. We quickly learned that the small tent, which was not being used, had collapsed and the large tent, which was unoccupied but full of radios and computers, had come unstaked and blown over in the wind. Those who were not helping with the equipment canopy were gathered in the food canopy. I pitched in on the equipment canopy rescue and Linda took the camera and joined the folks in the food tent. After gathering up all of the pieces of the canopy and getting them back in the trailer some of the team added extra ropes and stakes to the windward end of the food canopy and both the 20m and 40m tents. Another part of the team, including me, got Marty’s (KB8JIU) satellite tracking equipment out of the screen room, which had been draped with solid plastic tarps to keep the rain out, and then took the room down, disassembled the legs, folded it up, and stuffed it in the trailer. The red tent was stuffed under a picnic table that was in the screen room so I grabbed that and put it in the trailer. The support pole for one end of our off-center-fed dipoles was bending over to the south more than we liked. Steve, N8AR, tied a rope around the existing rope, which was inline with the antenna and being used to keep it taught. He slid the second rope up the first one as far as he could get it to go and then pulled it out to the northwest (the antenna was oriented east-west with the tension rope running east off of the east end). He pulled it out until the support pole was reasonably vertical and I staked it down. The winds really howled out of the north driving the rain before them. This shelter (from Costco) did not survive along with another tent and a screen room. So the bad news was that some of our Field Day setup had not survived the weather which had not even reached severe conditions. The good news was that our generator was still producing power, all of our towers and antennas were intact and functional, we had our two key stations on the air, and our food canopy was full of people and hot food. Not the Field Day everyone had hoped for, but a great opportunity for teamwork and camaraderie and a learning experience to be sure, even if it was not the kind of lesson we wanted to learn. We left around 7:30 PM and went to the New Hudson Lowe’s, which was very close to our Field Day site, where I bought 18 feet of AWG 6 stranded copper wire with a green sheath. As soon as the weather improves I plan to run this from the CEB to the ham shack and use it to connect the ground bar in the shack to the copper backplane (ground plane) in the CEB. I will then connect the ground on our Go Box (Icom IC-7000) to the ground bar and see if it helps with my noise issue. Back at the house Linda wanted to watch an episode of NCIS Los Angeles, which we can now do thanks to our new OTA TV antenna. We then watched an episode of Christina Cooks, Christina Perillo’s vegan cooking show from a decade ago. These are still relevant and useful episodes and we especially enjoy them having seen and met her and her husband Robert on our two Taste of Health Holistic Holiday at Sea vegan cruises. Linda read and I wrote for a while before lights out and off to sleep. This entry was posted in ARRL Field Day, Ham Radio, Home QTH, People-Events, Photography, SLAARC, Weather, WFPB and tagged Adams Electronics (AC8IL), ARRL Field Day, Atchison Memorial Park (Lyon Township MI), Cats, Christina Cooks (PBS), cowgirl steaks (vegan), Diamond SG-7900 mobile antenna, Elecraft K3s HF radio, flagpole vertical HF antenna, Flex HF radio, Hi-Q 6-80 mobile antenna, Holistic Holiday At Sea cruise, Icom IC-2820H dual band radio, Icom IC-7000, Lowe's (New Hudson MI), Marty (KB8JIU), Mike (W8XH), NCIS Los Angeles, non-dairy yogurt (Silk), OTA TV, Senate Coney Island (S Lyon MI), severe weather, SLAARC breakfast, SLAARC Field Day participation, software defined radio (SDR), Steve (N8AR), strong winds, vegan, WFPB, Yaesu FTM-400DR/DE dual band radio on 2015/06/27 by BRF. I confirmed yesterday that our awning windows would not be reinstalled until Friday, which left us free to go do something today. We made sure the office had my cell phone number and then left around 9:20 AM for Dunedin, Florida about 30 miles south of where we are currently “camped” at Suncoast Designers. Most of the drive was on US-19 with road construction and moderate-to-heavy traffic the whole way. US-19 from Weeki Wachee south to St. Petersburg is just not an interesting or pleasant drive. The destination was worth the drive, however, and we arrived at the eastern edge of Dunedin around 10:30 AM and parked near the Serendipity Café. Over the next hour we walked through Dunedin’s historic downtown area to the marina on the Gulf of Mexico and back to the car. Dunedin is the sister city to Stirling, Scotland and the historic downtown area reflects some Scottish heritage; at least the Scottish Heritage Center is there. It was a gorgeous spring morning for a leisurely stroll with clear skies, bright sunshine, and temperatures around 70 degrees F. This was the sort of day that shows a town like Dunedin in its best light. Dunedin had a nice look and vibe to it–a bit upscale yet funky at the same time–with an assortment of unique restaurants (no chains), shops, and art galleries. It was visually interesting without being pretentious. We were back at the Serendipity Café a little before 11:30 AM. We got a table for four and Donna and Michael arrived shortly thereafter. They had suggested this restaurant because it was approximately midway between our respective locations and it had some vegan items on the menu. Donna and Michael are members of our FMCA Freethinkers chapter and spent a few nights at Williston Crossings RV Resort in early January where we had a chance to finally meet and get acquainted. They have been vegans for a very long time, so we also have that interest in common. We were glad we could arrange another get-together with them before we left Florida. We lingered over lunch for 90 minutes enjoying good food and good conversation. I had a “Green Monster” smoothie made with spinach, pineapple, mango, and papaya. Linda and I split the Asian kale salad which included carrots, red pepper, and roasted pumpkin seeds in a ginger/sesame/tamari dressing. We then split the Penne Fresco; brown rice penne pasta with tomato, zucchini, kale, capers, white beans, olive oil, and dill. The ingredients formed a light sauce that tasted like butter. Served slightly warm, it was pleasant and delicious. We split a muffin with dried cherries in it for dessert. It’s always a treat to find a nice little restaurant with vegan choices and even better when we can share it with friends. BTW: every dish at Serendipity Café is organic and gluten-free. Donna and Michael had been on the Holistic Holiday At Sea cruise in early March so we compared experiences. They were on a different/newer ship than the one we sailed on so we could not directly compare notes on that. They found the educational aspects of the program very informative and decided to drastically reduce the amount of oil they use in their cooking. They were less impressed with the dining, finding many of the dishes bland compared to how they cook, the serving sizes too small, and the meals generally lacking in an adequate quantity of fresh vegetables. They ended up supplementing the special vegan dining with vegetables from the regular buffet. I think that IF you want to go on a cruise, and IF you are a vegan, and IF you would like to take something home from your experience other than a few extra pounds, then the HH@S cruise uniquely meets those requirements. If you are not really that interested in a cruise and/or gourmet vegan dining then VegFest in Pennsylvania provides the same or better educational experience for a lot less money. We left the cafe around 1:00 PM and made the 3 mile drive north up the coast to Causeway Blvd, so named because it crosses two bridges on either end of a sand bar to form the causeway that connects Honeymoon Island to the mainland. We had to wait briefly for the drawbridge to lower to get onto the island, which got its name when someone many, many years ago built 50 cottages there for honeymooners to use. The first part of the island has some commercial development, but most of the island is Honeymoon Island State Park; the reason for our visit. We used our annual Florida State Park pass to get in and headed to the nature center to rendezvous with Donna and Michael. The nature center is elevated, probably as protection against hurricane storm surge, but as a result it provides an unobstructed view of the park and surrounding water from its wrap-around deck. We got some good tips from the ranger about an active Bald Eagle nest and a Great Horned Owl at the north end of the Osprey Trail. We also noted the cautions about Eastern Diamondback Rattlesnakes that inhabit the island in significant numbers. The largest North American rattlesnake, it is one of the six venomous snakes found in Florida. We drove to the trailhead, parked, and headed out, but not before changing lenses on my DSLR. Any chance I had of capturing wildlife images would require my 100-300 mm zoom lens. The trail out was level, dry, and firm but not hard, with adequate shade. The trees were mostly shorter palms with occasional taller pines, and a light breeze found its way in from the water. The Osprey Trail was appropriately named. We saw at least a dozen Osprey nests, most of them occupied with immature birds. We eventually found the Great Horned Owl roosting high up in a pine tree. The Bald Eagle nest was at the very end of the trail, by definition, as the park had closed off the entire tip of the island to keep human visitors and their pets from disturbing the birds. The pair of adult eagles had successfully hatched two eggs and the immature birds were already fledged and out of the nest. We only saw one adult bird soaring high up and far away, but the nest was impressive enough even without the eagles in it. We took part of the Pelican Trail on the return hike thinking it might run along the water, but it was separated from the shore by high, thick vegetation. The trail was sandy and lacking in shade, making for a slightly more difficult hike. The air temperature was only 77 degrees F, but the sun was very hot, and we were all glad to get back to our cars. We chatted a while longer in the parking lot, said our farewells, and went our separate ways. Well, initially we went the same way; we were on an island after all, and there was only one way off. Causeway Blvd becomes FL-586 which we followed east for about five miles to northbound McMullen Booth Road. We followed McMullen Booth Road, which became E Lake Road, north for about 10 miles to Trinity Blvd. Trinity Blvd cut ENE to the southern terminus of Little Road, which we followed north for about 12 miles back to New York Ave. From there it west just a mile or so back west to Suncoast Designers. We were surprisingly tired considering that it had been a relatively easy day. Linda had some Tofurkey brand “fake bacon” made from tempeh so she made vegan BLTs for dinner along with a simple green salad. We went for a walk after dinner and strolled around the Suncoast property with Bill and Nancy who own the Newmar Essex next to us. A Country Coach Affinity 770 pulled in after we got back and the owner, Steve, came out and joined the conversation for a while. As dusk turned to night the air temperature dropped. We all started to feel the chill and retired to our rigs. This entry was posted in Family-Friends-Home, FL SP, Florida, FTH, RV-Travel, WFPB and tagged Asian kale salad, Bald Eagle nest, Bill & Nancy Cowick, Dunedin (FL), Eastern Diamondback Rattlesnake, FMCA FTH Ch, Great Horned Owl, HHAS, Holistic Holiday At Sea cruise, Honeymoon Island SP (FL), Michael & Donna Bartolomeo, Osprey, Penne Fresco, Serendipity Cafe (Dunedin FL), Suncoast Designers (Hudson FL), US-19, VegFest (PA), WFPB on 2014/04/10 by BRF. There is always lots to do around the house when we return from an RV rally, more so since we are still getting moved in to our new (to us) house and trying to get it ready for an open house / house warming. We decided about a month ago to have the house warming as a way to “force” us to accelerate the moving-in process and so far that seems to be working. Arriving home yesterday we were able to pull in to our pull-through driveway with the car attached, which was very nice. With the added “fines” (sandy silt) material mixed in with the 21aa road gravel, the driveway is now packing together very tightly and easily supporting the weight of the bus. The planned driveway geometry has worked out well allowing us to pull in and out with the car attached. That means we cook hook/unhook the car in the driveway rather than in the street. Linda babysat for Madeline on Monday while I worked around the house, unloaded the clothes and bedding from the bus, and started doing laundry; not very interesting, perhaps, but satisfying work in its own way. We both spent a fair amount of time on our computers this week, Linda with household accounting chores and RV park research and me with some CEPI work, our website/blog, and websites for several other organizations. Using WordPress to create/manage websites and blogs has really grabbed my interest. I’m not very proficient yet, but I’m leaning. We hung the last few pieces of artwork for now and spent part of the week opening and moving boxes. Linda was looking for papers we could take to a shredding company and managed to accumulate quite a few boxes of them. At this point we’ve run out of time to open boxes and sort through the contents, so we turned our attention to finding places to “hide” them until after the open house. We’re not there yet, but we are comfortable that the house will be presentable enough by the time it needs to be. We decided to harvest some of the apples from our apple tree and discovered that a large branch (3-4” diameter) had peeled loose in three places, probably due to the copious amount of fruit on it, the age of the tree, and the fact that it had not been pruned properly (or at all) for years. We don’t know much about fruit trees, but we know that this is not the time of year to prune them. With the tree obviously damaged, however, we decided to cut the branch off and let nature take its course. We took it off in three pieces to make sure we could handle them. The branches of an apple tree tend to get intertwined, especially if it isn’t pruned, so we really had to pull to get the pieces down. That brought lots of apples to the ground besides the ones on the damaged branch. We left the branches and their apples on the ground for the deer and other animals that frequent our backyard. We collected a large bag of apples and Linda spent time during the rest of the week peeling them, dipping them in lemon, and freezing them. She also made apple sauce and apple bread (both of which were outstanding). She commented at one point that “I am starting to understand why farm wives never got out of the kitchen.” Cooking real food with real ingredients (whole-food, plant-based) is a lot of work. Linda finds the work satisfying, however, now that she has the time to do it, and I certainly find the results satisfying as well. Yummy. Ed and Betty Burns arrived on Thursday afternoon in their Tiffin Phaeton motorhome and stayed until late Friday morning. This was their second visit in about a month and we really enjoyed having them here again. They have been working at the Middleton Berry Farm and finished their tour of duty on Thursday. I moved our motorhome out of the pull-through driveway so they could pull in and park in a level spot with power. They got here in time for dinner and Linda put out a nice meal. She served a nice Waldorf style green salad using some of our fresh-picked apples with homemade apple bread. The main course was a lentil loaf with a baked potato and homemade applesauce on the side. I chose the Blueberry Wine from Forestedge Winery in LaPorte, Minnesota to go with the meal. (It only occurred to us later than we had an apple wine from the same winery, which would have really completed our apple-themed meal.) Forestedge Winery is owned by Paul and Sharon Shuster, who are members of our FMCA Freethinkers associate chapter as are Ed and Betty. Linda made apple crisp for dessert, but none of us had room, so we saved it for breakfast the next day. In addition to the apple crisp, breakfast included Linda’s homemade granola cereal with fresh blueberries, fresh banana slices, and raspberries that we had personally picked at the Middleton Berry Farm a few weeks ago and frozen. A little orange juice and a 50/50 blend of Ethiopian Yirga Cheffe and Kona coffee rounded out the meal. We decided earlier in the week that we would try Florida for our first snowbird experience. (Snowbird is a term used to describe folks who live in northern climates where it snows and head south for the winter to get away from same. If there is a corresponding term for folks who live in the south and travel north in the summer to avoid heat and humidity, I don’t know what it is, other than perhaps Bridwons. Think about it.) Our decision was motivated by the desire to attend a large converted bus rally in Arcadia, Florida that is held each year from December 26 to January 1st. (The actual rally is Dec 29, 30, 31, but you can arrive as early as the 26th and departure is the 1st.) The rally was started by Jack and Paula Conrad, who ran it for the first ten years. Ed and Betty used to live in Florida so we were eager to draw on their knowledge and experience before trying to book a place or places to stay. Earlier in the week we called the Low-Key Hideaway RV Park and Motel in Cedar Key, but they were not able to accommodate us. We knew about Low-Key Hideaway Cherie Ve Ard’s Technomadia blog postings, and it appears that the place has developed quite a clientele, perhaps in part as a result of Technomadia’s publicity. At the last two GLCC rallies we had talked at length with Pat and Vicky, who winter in Florida. I also had an in-depth conversation this week with two other fellow RVers (Ed and Al) who winter in Florida and got their thoughts, suggestions, and recommendations. Our friends and fellow H3-40 owners, Chuck and Barbara, have spent the last seven winters in Florida and the last several at Pelican Lake Motorcoach Resort in Naples, Florida. We delayed our return home following the Holistic Holiday At Sea cruise in March so we could drive over from Ft. Lauderdale to see the resort and have dinner with them. It was very nice, as you would expect. The farther south you go, the more expensive it gets. The reason for the previous point is the average daily temperate range. In northern Florida it is not unusual for temperatures to drop into the upper 30’s at night, and record lows have been recorded in the teens. That doesn’t happen in Key West, and money tends to follow the pleasant climate. The closer you are to one of the coasts, the more expensive it gets. You pay a price for beaches and sunrises/sunsets. No-See-Ums, however, can be a real problem near the coasts, and some folks have very bad reactions to their bites. If the RV park has “resort” in the name, it will be more expensive, with “motorcoach resort” costing even more, and “luxury motorcoach resort” costing even more than that. Most of Florida is swampy; being inland or staying at a “luxury” resort does not guarantee that you are not camped in or next to a swamp. Think bugs, snakes, and alligators. You can almost always rent a deeded site at a higher-end park directly from the owners much cheaper than you can rent it through the park management office. Check the classifieds in the back of FMC Magazine. Moving every week is expensive and tiring, but gets you access to more of the state. Staying more than one month at the same place can get a bit boring, but that’s a personal thing. Some parks are in dense urban areas, others are near small towns, and some are in the middle of nowhere. It’s a shopping convenience versus solitude thing. You can end up having to drive 20 miles or more for groceries if you are not paying attention when you choose an RV park. Not all parks are “big rig friendly” (even though they will claim they are). Most parks have punitive refunds polices, so be sure before you know what they are before you book. Make sure your park of choice is located near things you want to do (hike, bike, kayak, fish, watch sunrises and/or sunsets, or have access to highways so you can visit natural and historic sites in your car, etc.) Tallahassee is not a good base camp for visiting Key West. Many RV parks are adjacent to a major freeway, railroad track, or airport; sometimes all three. If you don’t think the noise will bother you, you’re wrong. Some RV parks are gated (if you care). Whether the residents in a park or nice or not seems to have little to due with the physical appearance and amenities of the place. There are a lot of older parks with mixed use, i.e., year-round “Park Models” in addition to sites for vacationers and snowbirds. Check the type/quality of the interior roads and parking pads (concrete, gravel, grass, hard dirt, or sand), it might matter with a big, heavy coach. The spacing of the sites varies greatly; some parks have sites that are small and close together (but they will tell you they are very spacious). Find out whether there is any landscaping, especially shade trees around the sites. Find out whether the roads and sites have trees trimmed up and back sufficiently to not scratch your RV. Check to see if “lakes” on the property actually have water in them (seriously). Check on the availability and cleanliness of onsite bath/shower facilities and Laundromats. Check the availability of onsite activities (which could be a plus or a minus) and facilities such as swimming pools, tennis courts, etc. If you don’t want them, why pay for them? Find out if the park has pet restrictions, and if so, what they are. Some parks are 55+ operations, others allow/encourage/cater to families with children. Know which type you are signing up for and make sure it’s what you want. The photos on the website always look beautiful, but somehow manage to avoid showing you views of the parking sites from a vantage point that allows you to assess all of the factors mentioned above. Google Earth and other satellite image websites/apps are your best friend and ultimate research tool. Our goal was to book a park or parks for January and February by the end of the day Friday, but we didn’t make it; too much to ponder and no time to make phone calls. We will get back to it early next week as Tuesday is October 1st, and January 1st will only be three months away. Tom and Tom from TOMTEK HVAC were back on Friday afternoon to finish up repairs on our hydronic heating system. They did not have one of the parts they were going to replace but it didn’t matter as they discovered some additional issues that will require a return visit. The first thing they discovered was that the propane shut off valve didn’t shut off the propane. We had to turn off the supply at the tank so they could replace the valve before doing anything else. When they removed the propane diffuser cone to clean it and replace the gasket they discovered that the end of the cone had large holes in it. These holes were preventing the propane from burning as efficiently as it should, and if they got bigger could prevent the furnace from working at all. Parts like this for a Weil-McLain GV Gold Series hydronic heating system are not common, i.e., they don’t carry them on their truck or even stock them at their office, so they had to special order it. As long as they had the combustion chamber open, they went ahead and vacuumed it out. They had me look at it, and it had what appeared to be a couple of inches of rusty debris lying in the bottom, the result of a lack of proper (professional) service over a very long period of time (or perhaps any service at all). They put it all back together and will replace the diffuser cone, gasket, and igniter (along with the part they forgot to bring) when they return next week. I don’t know if this qualifies as serendipity in the usual sense, but we are lucky that we decided to have the system “serviced” in advance of the start of the heating season. If not, we would not have discovered defects that could have led to a wintertime failure of the furnace with serious consequences for the house. As I was working at my computer Friday evening an e-mail showed up with the PDF version of the October 2013 issue of Bus Conversions Magazine. The article I wrote on the mid-August Back-To-The-Bricks rally in Clio, Michigan was the cover/centerfold article, the fifth one I have had published in BCM. (See the BCM page of the website for the complete list and information about Bus Conversions Magazine.) That was a nice end to nice week. This entry was posted in Family-Friends-Home, RV-Travel, WFPB and tagged apple bread, apple crisp, apple tree, applesauce, Arcadia (FL) Rally, BCM, Bus Conversions Magazine, CEPI, Ed & Betty Burns, Florida, Forestedge Winery, granola, Holistic Holiday At Sea cruise, hydronic heating system, lentil loaf, Low-Key Hideaway, MIddleton Berry Farm, pear tree, Prevost H3-40, pruning, pull-through driveway, Technomadia, TOMTEK HVAC, Waldorf salad, website/blog, Weil-McLain Gold on 2013/09/27 by BRF.